Welcome to Challenge #9 - Anything Goes (with a ribbon). 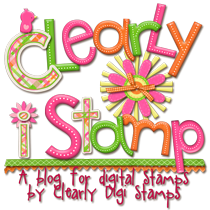 We are being sponsored by Clear Dollar Stamps and there's a great prize up for grabs. You can find great digital images as well as clear acrylic stamps on their website. Ready to play along? I used 2 different stamp sets from Clear Dollar Stamps ("New Butterfly" and "Elegant Accents") and and mixed it with some pretty "Iris" 3 Girl JAM ribbon to make my card. PaperTrey Ink - Plum Pudding, Stamper's Select White, and Vintage Cream card stock. I really like the way this card turned out. I made it for a special friend and I'm really looking forward to getting it over today. Thanks for stopping by today and remember to take some time to enjoy the little things. Super cute card. Got my happy mail...thanks, everything is gorgeous.